Professional photographers who use Lightroom have one more excuse reason to swap an iPad for their MacBook while traveling. Squared Enterprises has released Photosmith, an iPad app for organizing your photos on the road before importing them into Lightroom. Photosmith is a fairly full-featured photo organizer. Thanks to Apple’s Camera Connection Kit, it can import photos from most digital cameras, including many DSLRs. You can create collections, assign keywords, rate, label, and filter your photos. You can also set titles, captions, descriptions, and IPTC information, and you can even view EXIF data like ISO, shutter speed, and f-stop. The top bullet point for many photographers, however, will be Photosmith’s compatibility with Lightroom, Adobe’s professional photo organizer and editor. It’s worth noting that, for this 1.0 release, Photosmith is not a full two-way Lightroom sync client. But upon getting home from your photo shoot or family vacation, you can import all your photos, collections, and metadata from Photosmith into Lightroom—as long as you install the free Photosmith plugin for Lightroom. Squared Enterprises seems to have big plans for Photosmith, and it’s open to feedback from users on where to take the app. It’s set up a feedback page where you can vote on new features and submit ideas. As of this writing, the request for a true two-way sync with Lightroom leads the pack—my personal wish for Aperture compatibility is lagging behind. You can get a good look at Photosmith’s interface and the rest of its features in a grand tour that Squared Enterprises has put together. However, considering the app’s $18 price, a YouTube video of the app in action would be a useful addition to that page. 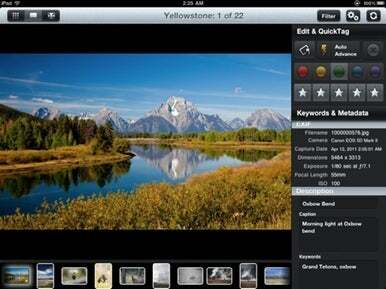 Photosmith requires an iPad running iOS 4.2 or later.